The menu consisted of drinks, appetizers, a main entrée, and dessert for 24 guests! When guests arrived, we confirmed their reservation and then called out “Smith, Party of 4!” and then showed them to their seats. If we were doing this again, we’d plan out exactly where each family would sit ahead of time to make sure that we had the right number of seats at each table. We had the drinks and appetizers set out first and guests served themselves. Then “servers” (i.e. library staff in aprons) cleared the appetizer plates and brought out the main dish. Once most everyone was finished with the main dish, we again cleared plates and brought out dessert for everyone. We had 5 staff members helping and serving and that was a good number for our 24 guests. Big seedless purple grapes work best for the bodies of the spiders. 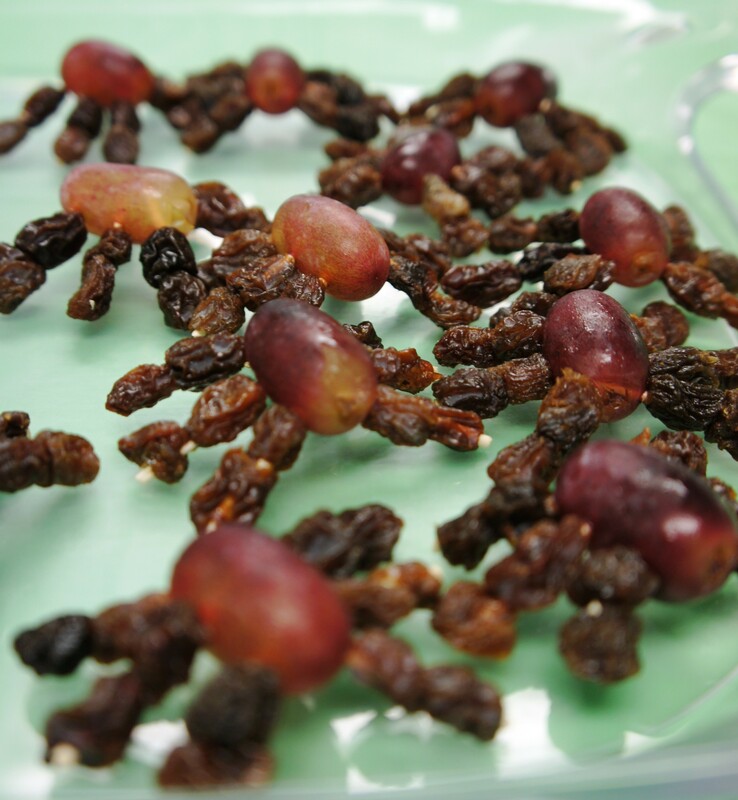 Add 2 raisins to each toothpick half. 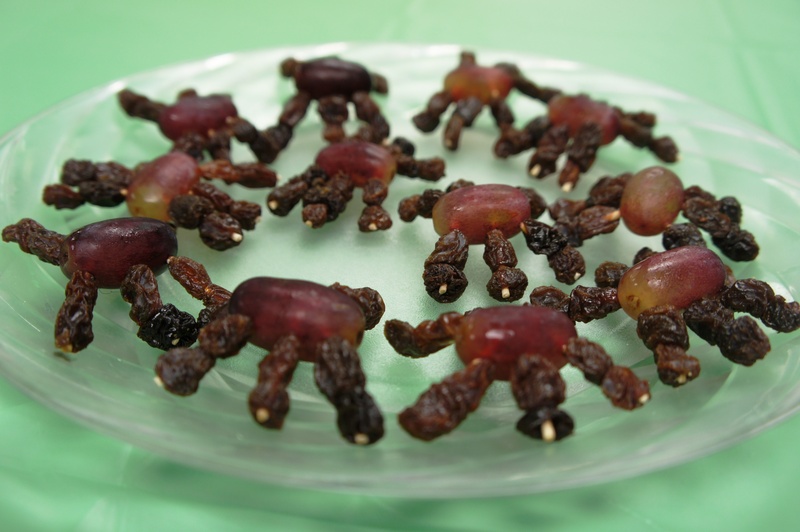 Angle 6 toothpick halves into the grapes to form the legs of the spider. They should be able to stand on their own! Fill a serving bowl with your favorite vegetable dip (It must be thick enough for carrots to stand up in – we used Marzetti Ranch Veggie Dip.) Dab a small amount of dip on the back of the almond slice to “glue” it to the top of a carrot. It will look like a fingernail. Cut out small notches on each carrot to make the knuckle lines. 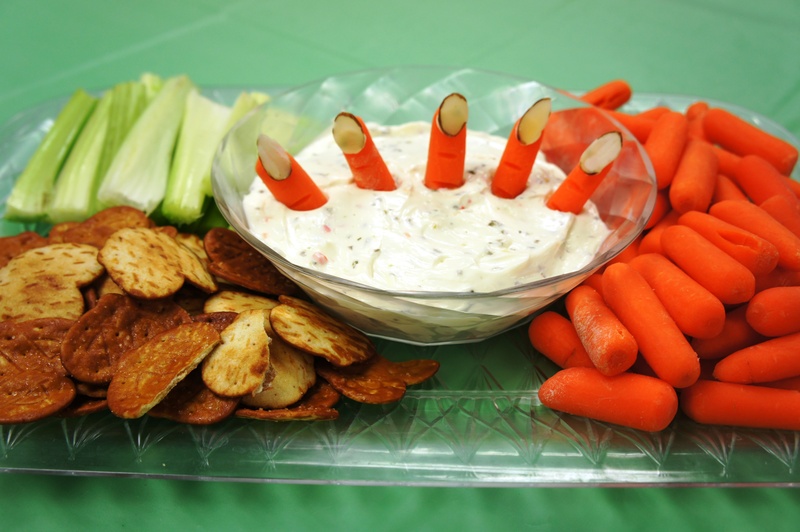 Stick the carrot fingers in the dip to look like a hand! Serve with veggies and crackers. 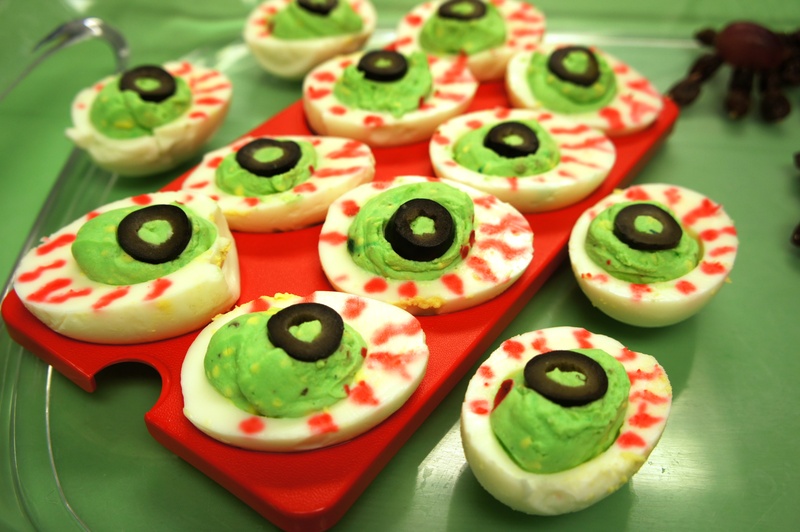 Make your favorite deviled egg recipe. (I used 1 dozen eggs, 4 T mayo, 1 T brown mustard, salt and pepper to taste, and 5 drops green food coloring.) To get your filling smooth, put it in a ziplock bag, cut the corner, and pipe into the egg whites. Place an olive slice on top of each half. Then use your red food marker to draw blood-shot eye lines. Don’t draw the lines on the night before because the dye will spread! I would recommend drawing the lines no more than 2 hours before serving. Make spaghetti and top with your favorite tomato sauce! We used the bulk size can of Hunts Tomato Sauce and added our own spices (1 T oregano, 1 T parsley, 1 T basil, 1 tsp garlic powder, 1 tsp onion powder, salt and pepper to taste.) Four hours before the dinner, we mixed up the sauce in a crockpot and let it heat up and simmer until dinnertime. 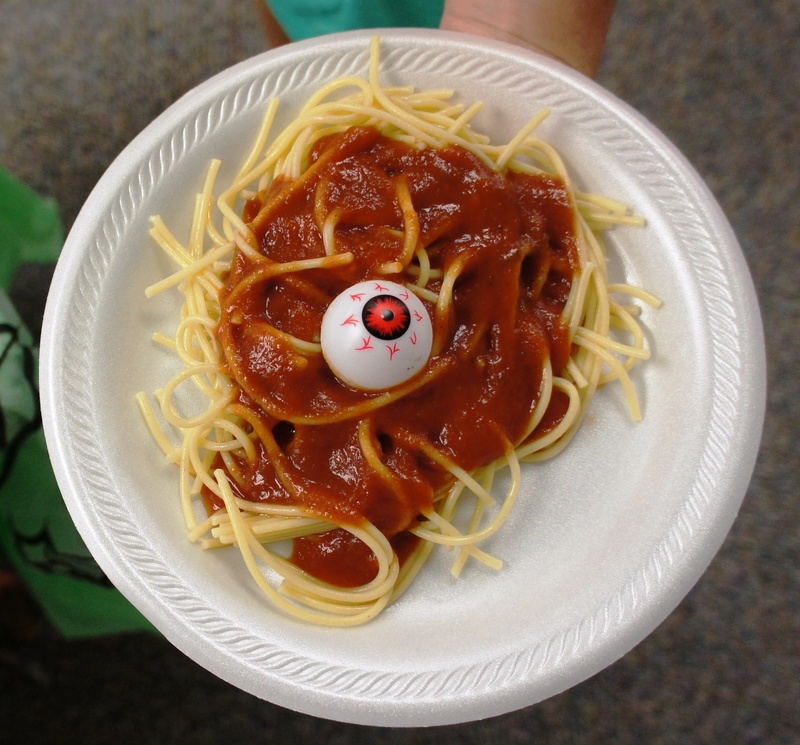 We decided to plate the spaghetti in the kitchen and serve it to each guest. This way, we made sure that there was enough for everyone. 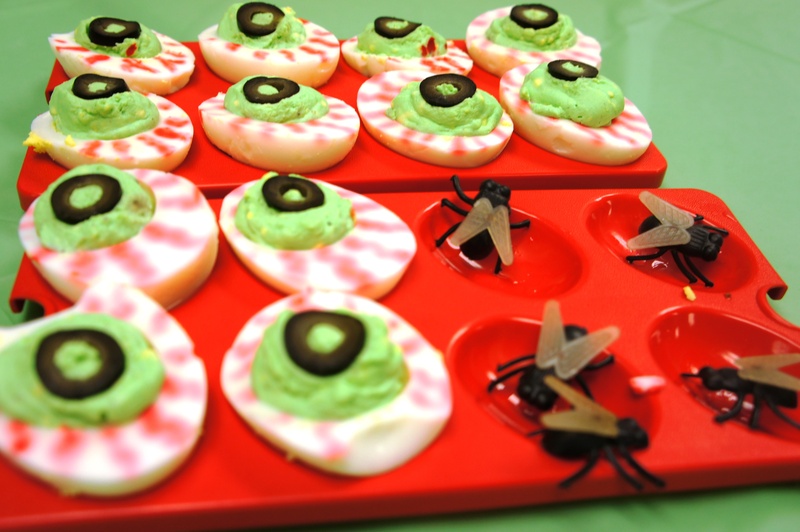 We topped each plate with a plastic zombie eyeball ordered from Amazon. 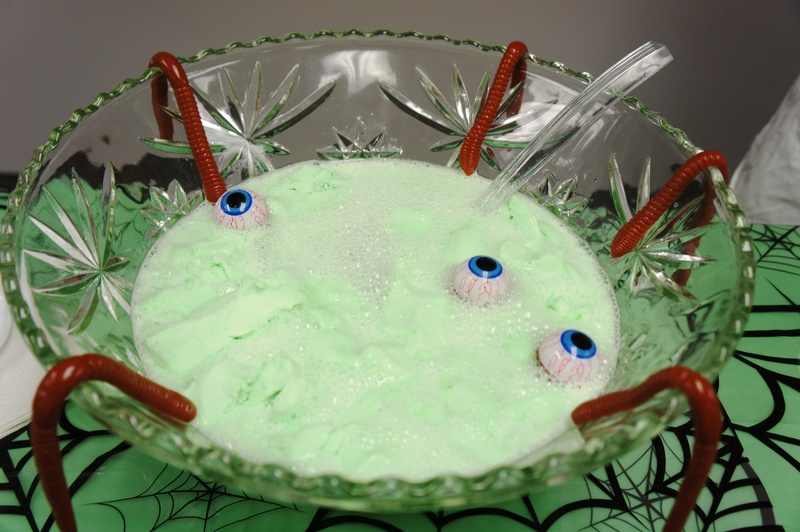 Make sure you order enough for each child to have an eyeball! I used Sweetapolita’s recipe for Chocolate Birthday Cupcakes (it’s practically one-bowl and the recipe doubled easily to make 24 cupcakes.) For the icing, I used the Best and Easiest Chocolate Frosting from Lauren’s Latest. It’s a simple, yummy buttercream! After icing the cupcakes, we dipped them in crushed Oreos (a few pulses in the food processor crumbled the whole box in a few seconds.) 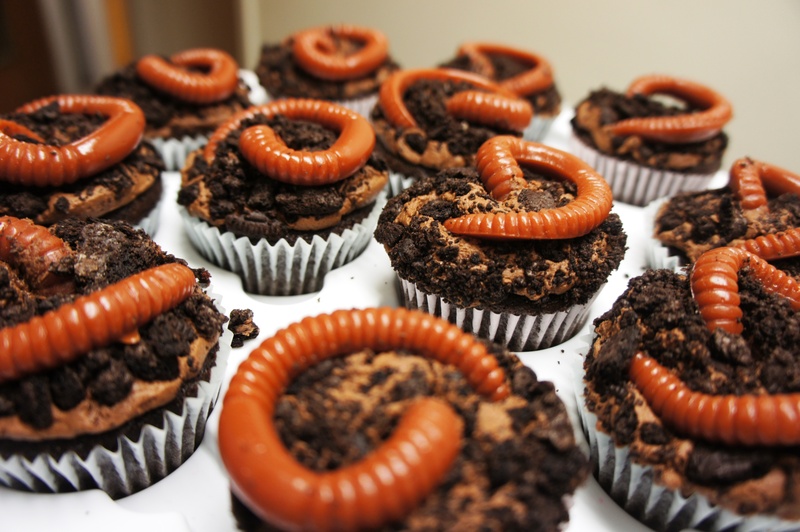 Then we sliced a hole in the center of each cupcake and poked the end of a gummy worm down into the cupcake. 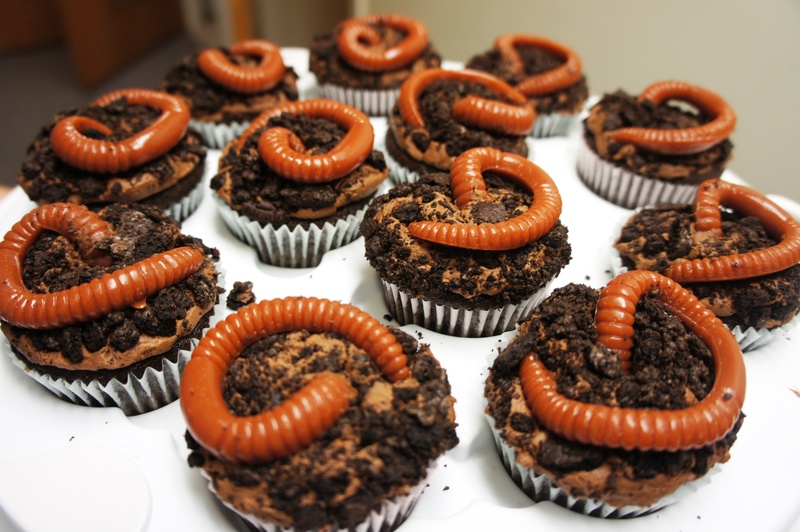 The kids thought it was SO gross to pull and stretch the worm out of the cupcake! OMG this is so vile. I bet the kids went nuts! I like this idea. Cool.